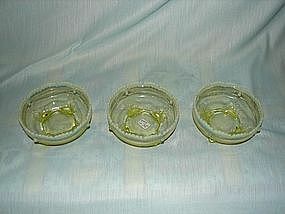 Vaseline 4" footed berry bowls. Very beautiful. Buy all three and get a fourth one free that has a tiny chip in one of the feet that is barely noticeable. The other three are mint condition. 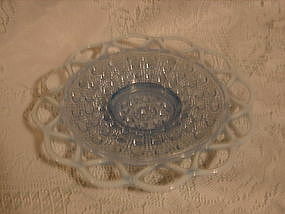 Fenton opascent blue three fluted epergene. 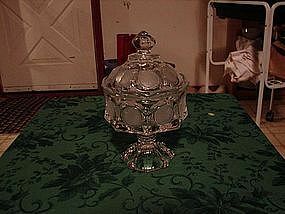 9" diameter and 7" tall. Very beautiful and in mint condition. Not a chip or crack anywhere. All three flutes are perfect. 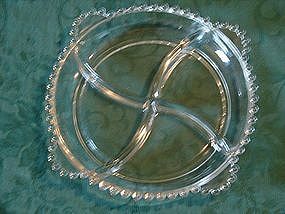 Imperial Candlewick four part relish dish. 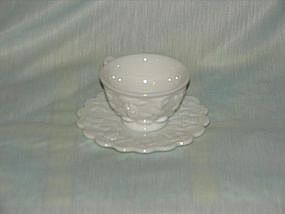 Excellent condition, no chips cracks. 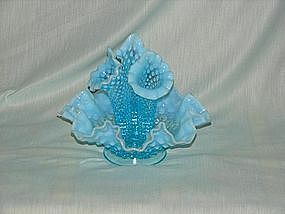 Fenton Flow Blue Mini tea set. Pattern is Azalea. 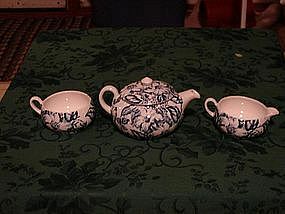 Teapot is 3" tall. Marked Azalea, Fenton, Kent England on a globe with crown on top. Lid of teapot has a couple of spider cracks visible on underside of lid. 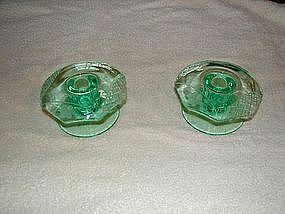 The other three pieces are mint. 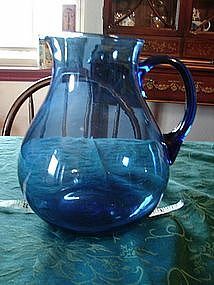 This is very early Fenton and hard to find in flow blue. 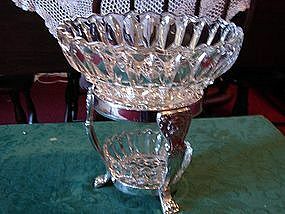 Fostoria clear coin glass compote. Circa pre-1985. 4" dia. Mint condition. 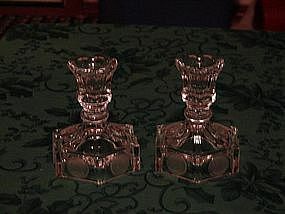 Clear Fostoria Coin Glass candleholders, Circa pre-1985. Mint condition. 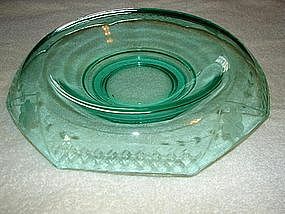 Green depression bowl. 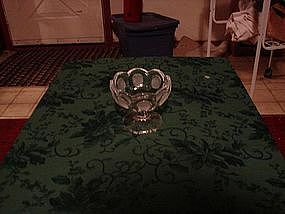 I know nothing about depression glass. The only resource I have is the internet. There is so much to choose from. 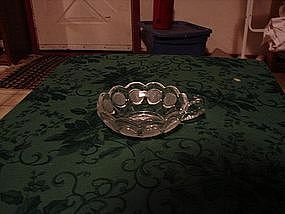 I priced this bowl maybe toward the lower end because I saw nothing like it. It is in very good condition. So, help yourself if you know what they are. One more thing it is two inches tall and ten inches in dia. 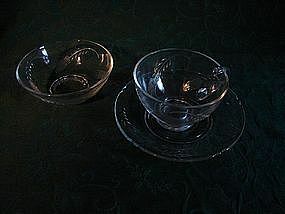 They are etched with some kind of flower. Yeah I learned how to copy and paste. 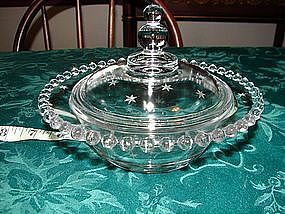 Imperial Candlewick covered bowl. 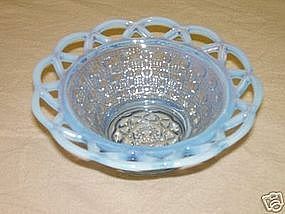 Bowl is 7" dia. and in mint condition.